Santons are the figures used to people Nativity scenes but they also depict famous figures from Arles and the Camargue. “Santons”, in Provençal “Santoun” (little saint), are small figurines made of clay, hand-crafted with loving care. 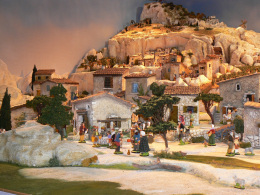 They can be found in the Christmas manger scenes where they are part of our Provençal traditions and reflect the life of the inhabitants and families of Provence. At the beginning, the family crèche represented only the characters of the Nativity : Mary, Joseph, the baby Jesus and the three Kings. To create their santons, the “santonniers” (santon-makers) of Provenceare also inspired by the old traditional activities of the working men and women of Marseilles, or the characters that appear in Christmas plays called “Pastorales”. But each craftsman fine-tunes his little statues with special attention to the details and postures. The work of each santon-maker can be recognized by these minute details, making his santons different from all others. Evelyne Ricord : sculptor, santon-creator, rewarded with the title “Best Craftsman of France” in the category “clay santons”. 6, rue du Refuge – 13200 Arles – 06 24 61 71 69 – By appointment only. Henri Vezolles Santons : hand-made “detached” statuettes in 2, 3 or 4 different colours of clay, natural or dyed with oxides. Decorative details are done with “barbotine” (clay-on-clay diluted in water). 14, Rond-point des Arènes – 13200 Arles – 06 80 34 27 77.